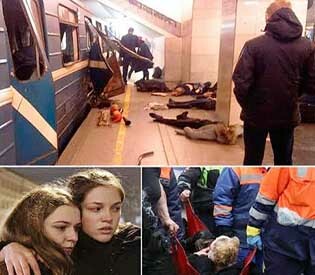 The death toll from metro bombing at St Petersburg has risen to 14, Russian health minister confirmed the toll. Ria Novosti the Russian agency quoted Ms Skvortsova as saying on Tuesday the total had risen from 11. Earlier in the day, State Committee for National Security of Kyrgyzstan said in a statement released it believed one suspect planted bombing was a Kyrgyz-born Russian citizen it identified as Akbarzhon Dzhalilov. Intelligence agency of Kyrgyzstan said Russian officials informed them about the Kirgizstan man, aged between 21 and 22, but they were not aware of his specific role in the bombing. The intelligence agency said the preliminary investigation show that he planted one bomb, the Kyrgs said they are cooperating with Russian authorities to help the investigation. Interfax news agency said authorities believed the 23-year-old suspect was linked to radical Islamist groups. The state investigative committee of Russia said the bomb may have been detonated by a man whose body parts were found in one of the train carriages. The Russian agency declined to give the man’s name, in contrast with its Kyrgyz counterpart. An unidentified explosive device went off at 2.20pm on Monday, on a train leaving the Technology Institute station and heading to the Sennaya Ploshchad station, Russia’s National Anti-Terrorist Committee said. The blast came as Russian President Vladimir Putin was visiting the city, his hometown. He said investigators are looking into whether the explosion was a terror attack.